Are you an avid football fan and want to watch the big game on an even bigger screen? Are you looking for a nice meal at a stylish bar? How about a crazy Bavarian night with steins of beer that you could probably fit into? Park Row offers all three under one roof, and no matter what your mood you'll no doubt have a fun night. On the top floor is Shooters Sports Bar; a place to loosen up with a burger and a beer while watching the near misses that make you and your friends wince. The selections of foods are light and easy going, enough to keep you on your feet during the match and the atmosphere is very laid back. Prices are reasonable, and with occasional promotions such as 'toss the boss' you can really enjoy your night. Order your drinks and then pick heads or tails, the barman flips a coin and if you're right, you get your round half price. Down stairs is The Park Row Bar and Brasserie, for those who want a filling meal to set them for the night. A great place to relax after a hard days work, or to meet the group and plan the nights endeavours. The food and atmosphere suit a milder night out, for those who just want to sit with friends and talk. If a livelier night is in store, and you want to laugh and cheer, then I recommend Bavaria. Don't worry, no flights are necessary, just go down in the basement. Traditional clothing and regional foods (not to mention the beer) make the night whole, whilst live bands donning accordions and lederhosen force a smile. You may not have planned to spend your night with a pilsner and a pretzel, but to be honest who does? Don't over think it, just ask for a stein and drink it! 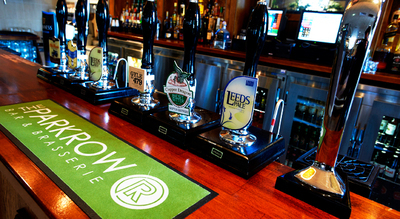 Three fantastic places for any mood, great prices and great food, The Park Row offers it all, which is great for when you and your friends all expect something different from the night ahead. Make sure to check their website for promotion information and upcoming events, and whether you like sports, dining, or men in leather shorts, go and have a fantastic night!